Boise State’s Research Computing Services team in the Office of Information Technology (OIT) and the Inclusive Computing Initiative Committee co-hosted the annual 2019 Research Computing Days (RC Days) to highlight the importance of data science, scientific programming, and computing skills to education, research, and the 21st century workforce. Sponsored by OIT and the Division of Research and Economic Development, RC Days gathered over 120 students, faculty, professional staff, and community members on February 11 and 12, 2019, from a range of domains including Idaho Policy Institute, Electrical and Computer Engineering, Information Technology Management, Biomolecular Sciences, and Ecology, Evolution, and Behavior. The 2019 RC Days saw a 20 percent growth in attendance over last year, with nearly two dozen departments across Boise State represented as well as attendees from industry, the Idaho National Laboratory (INL), Idaho State University, University of Idaho, the Center for Advanced Energy Studies, the Boise VA Medical Center, and the Oregon Institute of Technology. Faculty and student volunteers presented hands-on Software Carpentry coding workshops to introduce the basics for grappling with data. Workshops included Unix shell, version control with Git, and programming languages in R and Python. Thank you to all of our sponsors, presenters, funding partners, and the many volunteer instructor and student workshop facilitators. 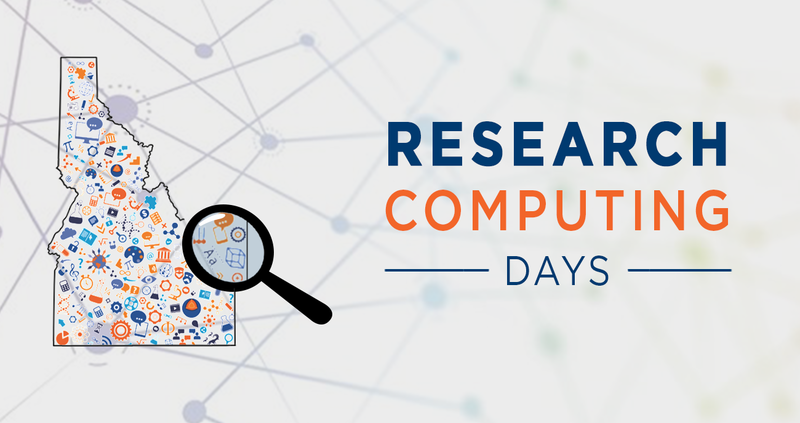 Please contact Mendi Edgar in OIT Research Computing at mendiedgar@boisestate.edu with questions about Researching Computing Days. And, mark your calendars for next year’s event, Feb. 11 and 12, 2020!